Half Price TOEIC in Adelaide, Hobart, and Perth? Almost. These 3 TOEIC® Test Centres are trialling a special price until June 2017. 4.Both get half price ($90 each). And we’ll wish you good luck in your TOEIC Test. •No, you can book separately. Just give your partner’s name. 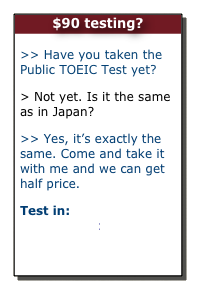 My ‘partner’ and I have both never taken the TOEIC Test, can we get half price? •Yes, as long as one of you hasn’t taken the test before. Can we test in different months? •No, you and your partner must test at the same session. If my partner doesn’t book in what happens? •Your test will cost $180. You have paid a $90 deposit. We will inform you 10 days before the test so you can remind them to book in. Can I do this more than once? •Yes. As long as you find a new ‘partner’ who hasn’t taken the test in Perth before. I don’t know my partner very well, does that matter? •You don’t need to know your partner at all, as long as you provide each other’s names and both turn up, you’ll get the test at half price.